Gah another weird week. I was really tired this week as I didn’t sleep well from sunday on monday because Snickers her surgery and it took me until the end of the week to get caught up with sleep again. I also had another headache that stayed around for two whole days, it was horrbile. And I can’t explain how amazing a day feels without headache after that. I had hoped to get some blogging and blog commenting done this week, but instead just barely managed to finish all my work for the day each day. Ugh it was frustrating! I did manage to write two Lola’s Kitchen posts yesterday, so that was nice. I got a nice surprise this week as my grandma gave me some money to buy something fun with. Ofcourse the first thing I did was go the bookdepository and splurge on some paperbacks, I got the two kelley Armstrong new releases for this year ordered which I hadn’t ordered yet (The Masked Truth and Empire of Night). 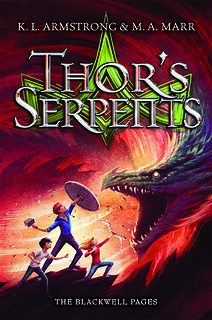 And I pre-ordered This Shattered World, the second book in the Starbound series in paperback and Dark Heart of Magic by Jennifer Estep (I am currently reading the first book and loving it). I haven’t spent any money beside thta, not yet sure what to do with it. Monday morning I had to stand up early to bring Snickers to the vet, after bringing her to the vet I went back home and did some work until I received the phone call Snickers was awake and her surgery went good. Then I went to the vet again to get her back. She was really active when we got home and was running around, probably due to the painkillers. Then she slowed down a bit and I took a 2 hour nap with her curled up next to me, it was bliss. I normally don’t sleep with the rats, but she was very quiet and I knew I wouldn’t accidently roll over her as I can remember those things even when asleep. Snickers didn’t like the painkillers, so it was a struggle getting her to drink them. In the end mixing the medicine with porridge was the only way to get her to drink it. She still isn’t eating and drinking a lot, so we’re a bit worried about that. It was a bit of a struggle to get her to drink and eat enough. We tried to give her some yummy food like rice, porridge, candies and avocado, which she does eay, although still not a lot. I spent lots of time cuddling with her and the place of shaved off fur after surgery always looks so nasty until the wound recovers. Smarties wasn’t too happy with the less attention she got, the poor girl. We did get her out every day to interact with Snickers, Snickers especially liked forcefully grooming Smarties to show her she’s still the boss even after her surgery. I also got some bad news financially and some days I wonder how long this financial struggle will continue, I am hoping one more year or a year and a half max. It’s so frustrating sometimes, I know there is no easy way to grow your business quickly, but it just goes too slow for my liking sometimes. And some days I just feel like I am doing it all wrong and handling things wrong and ugh. I want to organize more tours and worry less. So one day I felt down and the next day I got some good news and a new review opportunity, so that improved my mood. It’s been a lot of up and down emotions this week. Saturday: Dal Dhokli – recipe post coming in august! 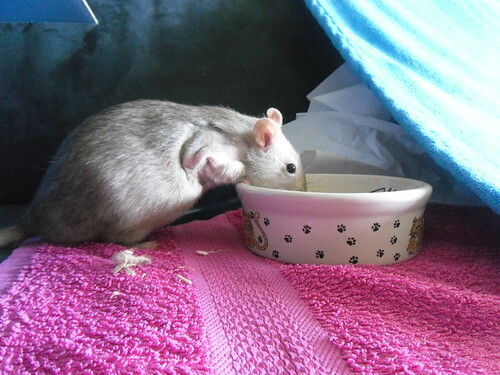 Snickers post surgery enjoying her porridge. Porridge is the only way we can give her something to drink and make sure she eats her medicine by mixing it with porridge. You can also see the shaved off part of fur here and her wound. Smarties is also happy with the porridge. – Lola’s Ramblings: What influences your enjoyment of a book? – Review Opportunity: The Other Side of Summer by Elyse Douglas– sign-ups open till further notice – New! I hope Snickers is feeling better. It’s never easy the first few days but they seem to be okay after that most times. Indeed those first few days are the hardest, after that she improved a lot, I am just worried as she doesn’t eat a lot. She does eat at night, but during the day she eats almost nothing at all. She even dropped her doggie cookies a few times, while normally she eats those as fast as she can. What a great week you have had on the blog here!! I really love that you got to splurge on some paperback from Book Depository…that is always fun to do. There is something about reading a paperback that is so different from reading from a e reading. Yeah it was a great week on the blog :). And indeed it’s so fun to splurge on soem paperbacks now and then. I mostly read e-books, but still love to buy paperbacks now and then. So from some of my favourite authors I buy all their books in paperbacks so I can still read paperbacks now and then. It’s very different from e-reading indeed. That was lovely of your Grandma, I love guilt free splurging. Hope those headaches pass soon, I suffer too and know just how great you feel when they finally life. Running your own business must be hard especially nowadays but at least you love what you do and that’s important too. My grandma is really sweet, she’s always sharing her money with her kids and grandkids. And it was nice to spent some money quilt free. I also bought soem new fleeche for the rats, as I like to fill their cage with it, but they tore holes in a lot of them, so I hope they appreciate some new ones. I usually have one headhache every weke or ocne a week, but they often get mroe frequent with the warmer weather. And I agree it’s very fullfilling to do something you love, but yeah we’re struggling financially and it’s hard sometimes, some weeks it hits me hard. But I know I made the right choice starting my own business, now hoping it will keep on growing. I do like when it when someone gives me money to splurge on some books instead of me just buying them for myself! I do need a book ban so I can get the tbr down a bit though…Enjoy your books! Yeah my tbr is very large as well, but these where all books I really want, so then I don’t mind adding a few more books to my list. And it’s so nice to get money to buy something fun as I can’t do that often. Glad Snickers made it through fine and hope her appetite picks up soon. Bummer about your headache. I had a sinus one yesterday after everyone mowed the grass. It does feel better after its gone. I remember the highs and lows of owning our own business. Some months were so good we were flying high and others we thought that we wouldn’t be able to pay the bills. You’re doing something you love so that’s a good thing. I hope her appetite returns soon as I am worried with ehr eatign so little. So it’s mroe yummies for her for a few more days. I always feel happy after my headache is just gone, it just feels so nice to be finally rid of them. I think most book lover weren’t surprised that my first stop was the bookstore. The second stop was buying some fleeche for our rats. I agree it’s amazing to be able to do something that I love, it’s just hard sometimes, especially as my boyfriend is still studying so he doesn’t have much money either. And my mom is constantly bringing up the money topic. I’ll be good again next week, some weeks I just need to vent. Sorry you weren’t feeling well this week, I had a rough week and didn’t get to visit anyone. These last few weeks have just been really hard. I have to get Kelley Armstrongs second book after Sea of Shadows, I think it’s out but I can’t remember, I was ok with the first book so I might have to do the library for the second one. I think financially everyone is hurting, I know we are and I am waiting on a loan that has been pending for about 5 weeks. It will help us a lot but it just needs to be approved. I am still getting everything organized for My Limabean Designs so just got to talk to the accountant and then register the name and I am set 🙂 Don’t think it will be big but even just doing a few things will make me happy! Yeah same here, I hope she makes afull recovery soon. Although I do like the opportunity to cuddle more with her now that’s she’s recovering. I reply to comments on my blog and just get some comments back in, but there are some blogs I haven’t visited in a while and that makes me sad. I did some commentign today, so hoping I can do a bit more commenting tomorrow as well. Yes the second book is out already, got it ordered even though I haven’t read the first book, but I am pretty sure I will enjoy it enough to read the second book as well. It would be nice if you could make some extra money with My Limabean designs. I hope you get those last few things sorted and get some customers soon! So glad the surgery went well for Snickers and hope she’s herself soon. Those two are such cuties:) And what a wonderful gift from your grandmother. Looks like you made good use of it. On to next week and I hope it’s better. Hang in there! I am always so relieved when they get back from surgery, I’ve been cuddlign with her a lot and hopign she recovers fully soon. I hope she get’s her appetite back soon. My grandma sent the oney to my bank account, so i called her to thansk as soon as she saw it, it was really nice of her! Your blog is so bright and pretty! I hope Snickers gets well soon. I always feel so sad when animals need surgery but I am glad the option is available to save their lives. Best wishes for a good week! Thanks! I love green and choose a light green so it stays bright :). And indeed it’s hard when they need surgery, but I am so happy the option is there, else we wouldn’t have any rats left at this point. They both have had a surgey already and this was Snickers her second surgery. Nope they are rats, if I was talking about cats that post would’ve been a lot different probably. Yeah I had a bit of a bad day when I wrote that, it’s just so hard sometimes. But I keep working hard and hoping things will be alright. It’s not that my business goes bad, it goes pretty well compared to last year, but it’s going slow. I am probably just impatient, but some more money would make things so much easier. Poor Snickers. 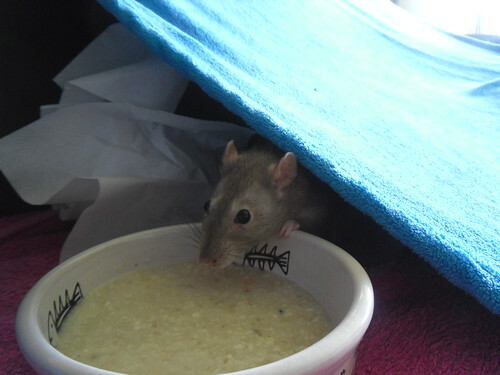 Looks like the rats enjoy the porridge. Always hate having headaches. I get so many sinus infections because the weather is constantly changing. Nemesis has a great cover. Hope you love all your new books. Yes they really like the porridge and it’s about the only moment they will sit still enough for me to take their picture. Else they either move too much or get interested in the camera. I usually get more headaches when the weather get’s warmer, I hope they get less once the weather settles. 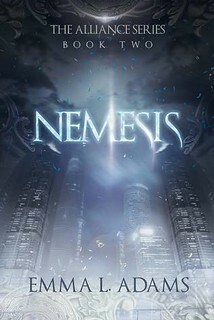 I love the cover for Nemesis, I’ll be starting that one next. The first was great and also had a pretty cover. Oh, I’m so glad the surgery went well! Poor little rat. I hope she heals up really quick. I had a headache too this week that I actually had to take pain killers for, which is something I rarely do, and I was tired too. I think it was the change in weather though. We went from hot to cold to warm again in the span of a few days. I really want some consistent weather soon! Thanks for taking the time to read and review RECLAIMED! I read through all the comments on that post but didn’t comment myself 🙂 It was nice to see the responses from people. Have a better week this week! Yes some consistent weather would be nice! It probably will help with the headaches as well, I usually take soem paracetemol nowadays when I have a headache, although they don’t help every time. I am so happy Snickers surgery went well, just worried about her appetite. It’s hard to get her to eat and drink when she doesn’t want to. I hope the surgery went for your rat 🙂 & I do look forward to your post as always. I really liked These Broken Stars so here’s to hoping you liked it somewhat as well! Hope you have a wonderful week LOla. benish recently posted…Mini Reviews ♥ The Heir, Saint Anything, Dangerous Girls and more. Thanks! And yes I liked These Broken Stars and already ordered the next book. I gave it a 4 star rating, I had a few issues with it, but overal I thought it was a great character driven story. 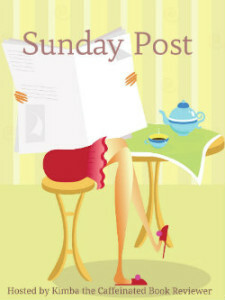 Hope yol stop by to read my review on saturday :). Glad Snickers’ surgery went well! Sorry about the bad news, but glad you had a nice surprise from your Grandma. Hope this week is great. Thanks! This week certainly had some up and downs. Awwww, Snickers!!! I hope him a fast recovery and soon. I was very anxious when my dog underwent surgery to get himself neutered, too. He wasn’t eating much and was sleeping most of the time for 2 days and it was just nerve-wracking! Faye M. recently posted…Random Things in Motion #20: Dear Generic Fantasy Books, Orcs/Dwarves/Elves Have Stories, Too! Thanks! It’s always hard and stressfull when they have to go for surgery and then the recovery afetrwards. Snickers is sleeping a lot as well and she only is active in the evenings. Things with my business are going better than last year, so there is definitely an increase, it just doesn’t go fast enough and to be struggling for so long is exhausting. It is definitely hard to have financial trouble, it puts a shadow on most everything else, too, because having to count and recount is both frustrating and a little scary. I hope you’ll be able to deal with this as well, and that more work will come your way so that things will become easier sooner rather than later. She’s still not eating and drinking much, but I hope that improves this week. Yeah it’s exhauting and stressfull to think about every little cent you spent or having my mom bring up our money issues in every talk we have. And indeed like you said it puts a shadow on most everything else. I am hoping I can get some more work and keep doing a little bit better every month. I am already doing a lot better than last year, but it’s hard to focus on the positive, when we’re still struggling. I really hope Snickers is okay!! I’m hoping to read These Broken Stars soon and definitely need to read The Masked Truth! Kelley Armstrong never fails me. We think Snickers will recpver nicely, she’s starting to eat a bit more, so that’s good news. I really enjoyed These Broken Stars, it’s very character driven, a bit sci-fi and a bit survival. I love Kelley Armstrong her books, so even though I don’t read a lot of thrillers or mysteries, I just have to read The Masked Turth as I am sure it will be good.